These "Futbolistas" are wonderful ! Same-same in the Western Hemi, where the U.S. and Canada are the only places where the women get real respect for playing; the Latin countries are impossible and in South America there's basically Brazil and a bunch of places where the men barely let the women past the touchline. Not really all that different today at least for some, as you noted in your comments about the Williams outburst. I love great-grandmas. I also wish I could hit a like button for other commenter's comments (like Diane). I have no idea what you're talking about on this post, but I think it's cool anyway. Merci! I'll check out your blog - thank you for the link. If the movement northward mean that women's football were more supported Germany would be less strong than its Scandinavian neighbors. If there is a North-to-South thing, perhaps it expressed more in terms of 'the Global South' - zones of super-exploitation? That said - Women are playing in Brazil, in increasing numbers and with increasing visibility (you'll find links to sites for women's football in Latin America in my blogroll). We don't know nearly enough about the scene there - international journalism on women's football is nonexistent. But if it were that terrible, Marta wouldn't by playing off season for Santos! Thanks, Jennifer, for this fusion of the arts, feminism and economic justice. That women's football has cultivated an "anti-capitalist, labor-oriented ethos" makes me wonder why Eduardo Galeano and those sharing his sensibilities have not explored such aspects of the women's game. I suppose there is residual thralldom to football as a marker of male potency. I'm not sure if you came across this article from the magazine at Universidad Pedagógica Nacional Francisco Morazán in Honduras, reprinted in 2006 by La Prensa in Nicaragua: "La pintura latinoamericano y el futbol." The author, Javier Ramírez, says that Zárraga includes his first wife, Jeannette Ivanoff, in the "Fútbolistas" canvas. 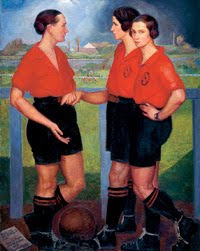 In another work, "Futbolista Rubia" (Blonde Footballer), Zárraga uses Diego Rivera's wife, Angelina Belfo, as model. The article also surveys the relationship between European and Latin American visual artists and football and provides numerous examples. I love that you imagine me reading Hondoran & Nicaraguan journals & newspapers. Actually, I just had a chance to scour the databases for information on this painting - I'm very grateful to you and Frederic (whose site is really interesting!) for the information about this work. If you haven't read Barbara Jacobs's book, I really recommend it - I think it's one of my favorite works of football literature at this point - in part because it's intercut with song - a book that breaks into pub chants! Really great stuff, by a writer with a deep passion for the subject. Thank you for your comments on my book. As you rightly suspect, I'm intrigued by the social history and political history aspects of it. And thanks for recommending it! Having just discovered your site while prowling for post-Brazil info, I am pleased that two of my passions, football and leftist philosophy, have found an enthusiastic patron. However, on the subject of early feminine footballers, I came across the same info in one of my soccer tomes and was profoundly angered at the denial of the game to your gender. Now, though of a left bent, I would not characterize my anger as being a product of male empathy for feminism per se. No, what burnt my biscuits was the knowledge that these ladies had the same fever in their blood for this game that I do and were prohibited from expressing it. I know how consuming this love for the game and to contemplate not being able to go out on a pitch and kick and run and suffer and exult would be the cruelest torture for me. That this was done because of sexism and medievalist thinking just gives it a sanitizing name, and cannot adequately portray the injustice done to 50% of the population for decades. That "times have changed" merits an entire dissertation unto itself, but the fact remains that women sport remained subsumed under layers of discrimination even more profound than racism, which eventually was overcome in the male professional sphere because of economics more than any 20th century "enlightenment." Now I'm ranting, which I usually reserve for politics. I will opine later on the refereeing in the Brazil game, which will turn conventional post-mortem opinions on their heads.